Collectors frequently sell old Sinclair products on eBay.co.uk. Click the "GO" button on the left to find any Sinclair joysticks being auctioned. 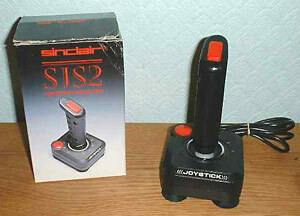 Amstrad's SJS2 (Sinclair Joystick System) was, like its predecessor the SJS1, a cheap digital joystick from the Far East which was sold as an accessory for the Spectrum +2 and +3. The device appears to be somewhat rare today, perhaps a sign of poor sales. It is unclear whether the SJS2 was included in Spectrum bundles as was the SJS1.